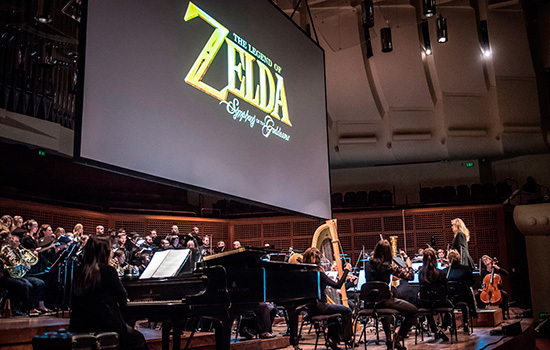 “The Legend of Zelda: Symphony of the Goddesses,” featuring music and scenes from the Legend of Zelda video game and a panel discussion afterward, is co-sponsored by RIT, RIT’s MAGIC Spell Studios and Upstate Region Interactive Technologies Hub. The Rochester Philharmonic Orchestra will kick off its month-long schedule of fantasy-themed concerts with the “The Legend of Zelda: Symphony of the Goddesses,” at 8 p.m. Friday, Nov. 11, in Kodak Hall, Eastman Theatre. The show, which includes scenes from the popular 1980s video game projected in high definition on the big screen, is co-sponsored by Upstate Region Interactive Technologies Hub, Rochester Institute of Technology and RIT’s MAGIC Spell Studios. Cosplay (costume play) is encouraged at the performance. Led by conductor Amy Anderson, the multimedia performance features 28 years of music from the Nintendo game series performed live by the RPO, together with Rochester chorus group Madrigalia. Following the performance, Shannon Symonds, associate curator from The Strong’s International Center for the History of Electronic Games—the concert’s promotional partner—will lead a panel discussion alongside Al Biles, professor of interactive games and media and RIT MAGIC Center affiliate, and James Zolyak, a fourth-year game design and development student at RIT, who worked on the award-winning, student-developed video game Hack, Slash & Backstab. Hack, Slash & Backstab recently became the first video game created by a university to launch on the Xbox One and Steam gaming platforms. Biles believes that there are several reasons the music from Zelda is so iconic. He said aside from just being “really good music,” it is integral to the game play and is initiated and performed by players as part of the game mechanics. According to Jennifer Hinton, chief communications officer of RIT’s MAGIC Spell Studios, the connection among partners and affiliates like RPO and The Strong help focus attention on the local gaming industry. MAGIC Spell Studios, which will officially launch with an invitation-only event at RIT Nov. 15, was created to meet the needs of the rapidly expanding digital media industry. In addition, RIT’s game design and development program was recently ranked third at the undergraduate level and seventh at the graduate level, according to the 2016 rankings from The Princeton Review. Tickets for the concert start at $23 and are available online at rpo.org, by phone at 585-454-2100, or in person at the RPO’s new Patron Services Center (108 East Ave., Rochester) and at all Wegmans That’s T.H.E. Ticket! locations. The 2016-17 RPO season is presented by Dawn & Jacques Lipson, The Philharmonics Series is sponsored by M&T Bank, the RPO Pops Series is sponsored by Canandaigua National Bank & Trust and Wegmans, and the OrKIDStra media sponsor is KidsOutandAbout.com. RPO performances are also made possible by the New York State Council on the Arts, with the support of Gov. Andrew Cuomo and the New York State Legislature. Additional support is provided by Monroe County, the City of Rochester, the Alfred Davis and Brunhilde Knapp Artists Performance Fund, the Mozart Performance Fund: Sarah D. Atkinson, M.D. and Steven Hess, and the Katherine T. and Jon L. Schumacher Orchestra Musician Soloist Fund.